Pure Carbon Graphite Packing : Pure Carbon Gland Packing Manufacturer in India, Kevlar Cloth, Kevlar Cloth Manufacturer, Manufacturer of Kevlar Cloth in India, Kevlar Hand Gloves. 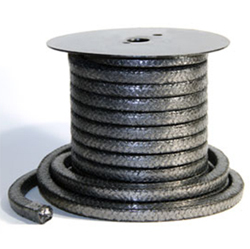 Pure Carbon an Interbraid multiservice carbon filament packing for pumps and valves. It is a special packing with low friction characteristics adapted easily and quickly into the equipment and requires only occasional gland adjustments. Its heat sinking ability makes this packing an ideal seal in high speed rotary equipment, sealing against boiler feed water, steam, oils, aromatic aliphatic solvents, acids and alkalis except fluorine, oleum, fuming nitric acid and aqua regia.